OUR PRICE: $59.30 - Join Rewards Get $5 Dance Dollars On This Item! 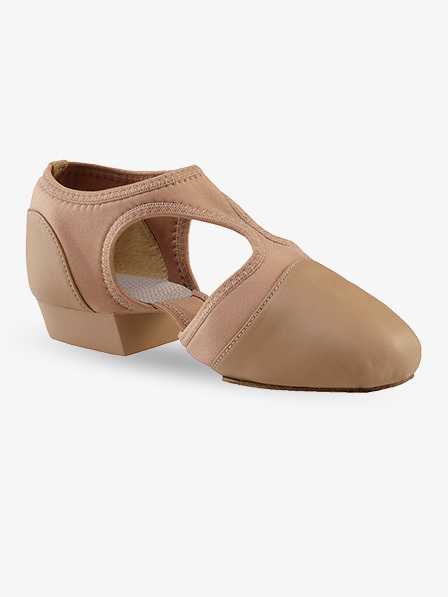 Capezio's "Pedini Femme" modern shoe is made out of a combination of Second Skin PowerPointe leather and Neoflex, allowing this contemporary lyric shoe to mold to the foot and accommodate any foot shape. Other features include an easy slip-on design, elasticized binding, DRYZ lining to provide absorption and aid in odor control. This shoe features the original elasticized gore arch insert that provides great arch exposure. The heel is made of expanded PVC making it lightweight, non-marking, supportive and improves shock absorption and grip. I ORDER THESE FOR MY 15YR OLD DD FOR HER UPCOMING COMP SEASON AND I ORDER HER STREET SIZE LIKE STATED. I ENDED UP REORDERING HER WHOLE UP BECAUSE THEY RUN SMALL AND DD COMPLAINE ABOUT HOW THEY WHERE EXTREMLY TIGHT. DD SAID THE LARGER SIZE WAS TIGHT ALSO BUT WAS ALOT MORE COMFORTABLE AND I FIGURE THEY WOULD LOOSEN UP MORE WAS THEY GOT BROKEN IN BECAUSE OF THE NEOPRENE. You will need to purchase half a size up from your street shoe. I like the shoe visually, fits snug and shows off your point nicely. However it gets uncomfortable after an hour of wear, as the heel begins to dig into your foot. I'm going to add a heel padding to hopefully alleviate this discomfort. The shoe is comfortable for the most part, but does run about an entire size too small. It says to order the same size as street shoe, but go at least a half a size larger. They do stretch slightly. The shoe is well made and generally comfortable. Looks great with fishnets with a rinestone back seam! 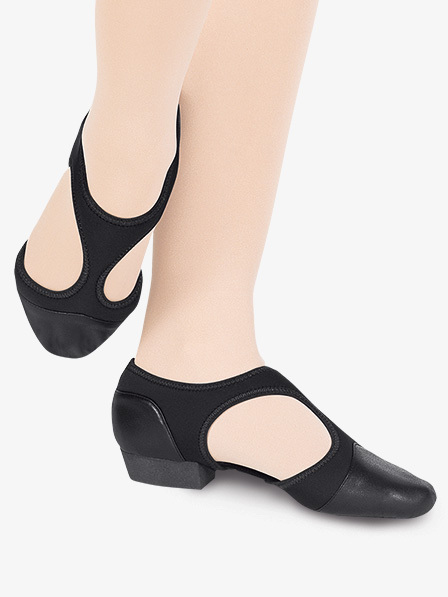 My company used these specific shoes for a jazz piece and I love them. The way it is constructed complements your arch very nicely. It is also very nice that the bottoms are suede. This makes turning much easier compared to normal jazz shoes which stick. The only downside is the heel sometimes fall off so I have to adjust them occasionally. Overall this shoe is the best jazz shoe I have ever worn. I've had these shoes for 2 years and I teach about 8-10hrs of ballet a week and I would think they would have stretched out but they haven't. I wear street 7.5 and went to a store and the 7.5 seem to fit fine but the front of the heel digs into my foot and my big toes hurt after a couple hours of wear. I would go up 1/2 size if I were to buy these again. I have to put padding into the heel of the shoe so it doesn't cut into my foot. They have lasted very well but I have to buy new shoes because I teach 3+ hrs of ballet a day and I can't wear them that long. Again, I hoped they would stretch out and stop hurting my feet but, alas, they have not. These were purchased Sep 2010 so hopefully they are updated and better now. These shoes are awesome. I love them! My friend wore them to the studio and then everyone wanted them. The heel slips off but if you order a slightly smaller size they wont slip. They are beautiful and they make your feet look great! My favorite jazz shoe ever. EVER! I own the black pedini they are so comfortable and you can wear them for many years. It helped my dancing abbilities and skills its very nice and soft. I use it for plays,theater, dance recitals and class its just very durable and I love it. I bought my third pair of these. At first I read recommendation to buy a size smaller, which I did and I can wear them, but they feel tight, so I bought another that was half size smaller, and recently one that is my street size. I've been wearing these for about a year and I am very happy with them. I wear them for salsa practice and I walk with them outside - I don't recommend them for dancing outside. I got those in ballet pink in size 7.5, I usually wear 7 or 7.5. I use them mainly to teach ballet but I took a few Jazz classes in them as well. They are very comfortable and I personally find them very stable. They show off my arch better than any ballet flats I owned... I which I could find a ballet slipper like that. I bought these for a competition number and through out the year the leather on the ball of your foot started to come unswen. Sometimes when you land a jump, the heel comes out from under you, but overall they're great. I love these shoes. I wear them for my troupe and they work awesome. They are tight at first but they stretch. I recommend these to everyone!!! They are comfortable and lightweight. They feel kind of loose and not stable at the beginning, but after wearing them, you start adjusting and finding your balance. Then they feel great and don�t want to change to any other shoes. The only suggestion I have is to buy 1/2 or 1 size bigger than your street shoes size. I had the 321 adult teaching sandal prior to purchasing these. Not too much difference. I prefer not having a buckle and the feel of these. I took a 7 in the other style, but needed a 7.5 in this one. I hope that helps someone since the suggested fitting did not help me at all. I do not have a narrow foot, but not what I would consider a very wide one either, and these are great. The caramel color is much nicer in my opinion than the tan in the other style. I hate how loosely they fit! I have a foot that's medium in the front and narrow in the back and I wear a 7. With these, the ball of my foot tends to slide out when doing pirouettes and fouettes (especially on a marley floor!). I would only recommend these if you have large/wide (size 9 or above) feet. These shoes are great for practices and teaching! I use these shoes for hip hop jazz modern and a pink pair for ballet. They form to your feet and never get uncomfortable. (I've never worn them for more than five hrs.) I think these shoes are great and last a long time. You should definitely get these!!! I have had these shoes for three weeks now and wore them daily. To date, I prefer the original Pedini even with the buckle. My biggest problem was with the heavy elastic. I have a medium width foot and heel, but found the neoprene elastic to be consistently uncomfortable after one hour of dancing. I also have blisters on both as a result of the fabric seam where the neoprene meets the leather. I wonder if anybody else had these two problems. The fit itself was great. This shoe hugs the arch beautifully. I dance over 20 hours a week and need a shoe that remains comfortable and supportive for 3-5 hours of dancing per day. Are these shoes machine washable? This shoe is made of leather, so machine washing is not reccomended.